Join us to celebrate the launch of our 2015 Spring collections on Thursday, February 19th. Stop by our New York showroom any time throughout the day to view Palais, Seychelles and Labyrinth in the company of fellow designers, editors and industry friends. Director of Design, Marisa Gutmacher, will be in the showroom offering insight on the construction, creative process and inspiration behind the three new collections. Champagne and refreshments will be served from 1 to 3 p.m. See below for details. In one of her two new collections designed for Samuel & Sons this fall, Lori Weitzner combines her lyrical, painterly approach with dimensional embroidery and her signature sophisticated palette. The Four Seasons Collection of embroidered tapes offers a contemporary take on florals in four seasonally inspired colorways: Spring, Summer, Autumn and Winter. Original artwork created by Lori inspires the collection’s floral motif. Lori Weitzner has long been associated with many of the industry’s most influential and respected brands. 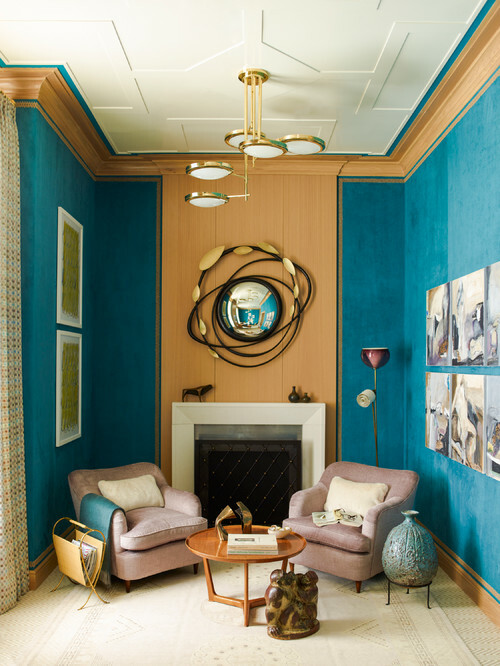 She has earned recognition through her textile and wallcovering designs as well as several collections in partnership with Samuel & Sons Passementerie. 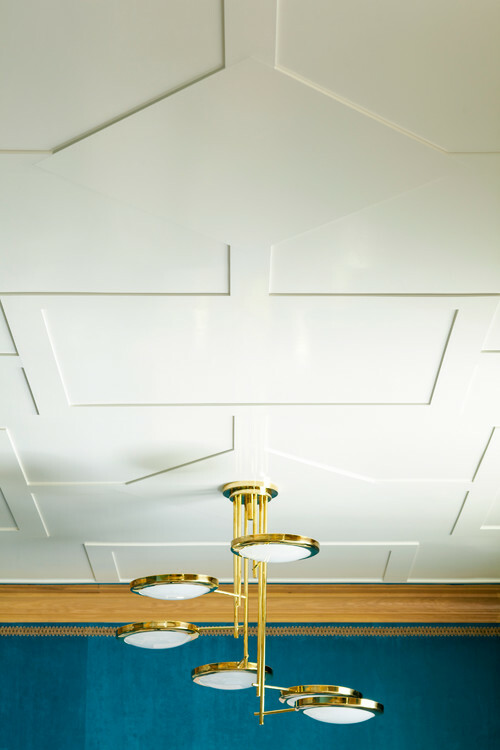 A guiding principle for the Samuel & Sons design team is that with each new collection, beyond creating beautiful trimmings of the highest quality, we introduce something new, something unique. Harnessing years of experience, and a depth of technical knowledge that only a select few in this country possess, the level of innovation that we employ with each new collection is what sets Samuel & Sons apart. You will see advances in color, materials and construction throughout our Fall 2014 introductions, including the Toscana Italian Leather Collection seen in our last post, and the new beaded and bullion fringe shown below. New for fall, Aquitaine Fine Bullion Fringe is a fine branch bullion offered in a timeless range of colors. 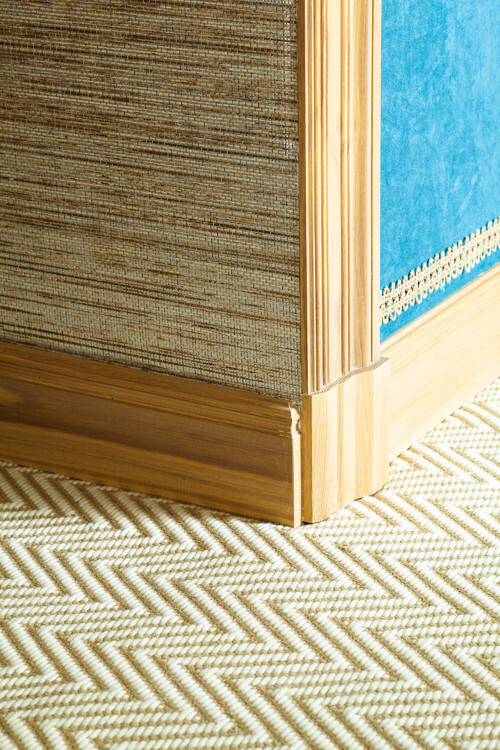 Notice the intricate header with its rolled cord edge and linear border stripes. The collection offers a palette of 17 colors including Gold and Silver, which combine matte and lustrous yarns. Taking color cues from Venetian glass crafted on the island of Murano, an art form in practice for over 700 years, our new Ajoutée Tiered Glass Fringe combines silk threads with glass beads in a luxurious, hand-knotted tiered fringe. Each bead is strung and individually knotted on silk hangers. The hangers criss-cross over one another and suspend from a tailored header. 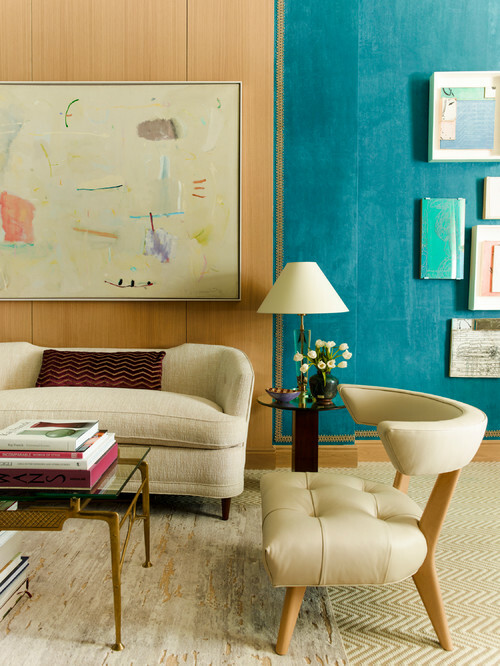 Ajoutée is available in 18 rich, saturated colors. If you happen to have missed our most recent post, click here to learn more about our new Toscana Italian Leather Collection. And for more information or to request sampling, contact your nearest showroom. Pictured above, Opaline Cultured Pearl Fringe. 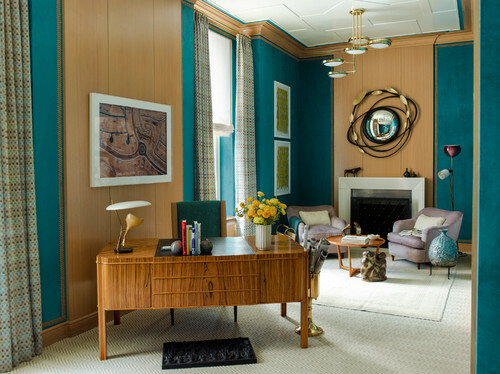 It is always an honor to be on display at the prestigious Kips Bay Decorator Show House. 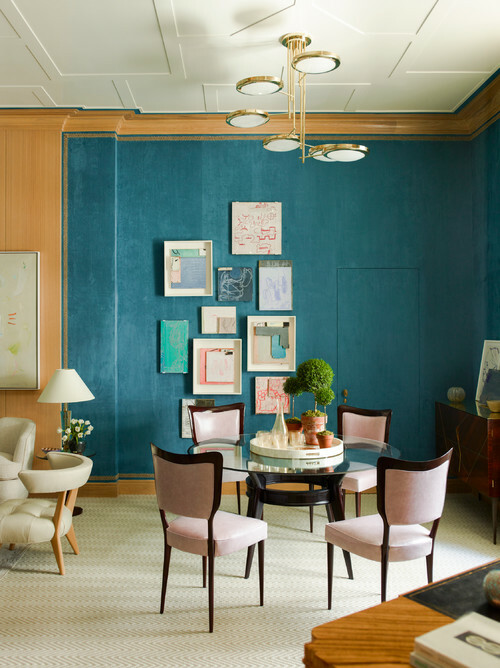 This year, we were delighted to see Samuel & Sons Passementerie trimming the walls of a space designed by the New York firm, Mendelson Group. 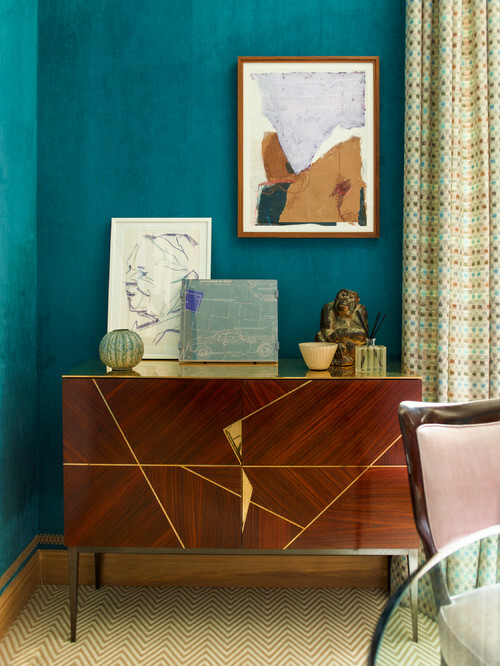 Our 1.75” Canopy Braid from the Oasis Collection by Lori Weitzner paired beautifully with suede walls in a shade of deep teal; a rich backdrop for neutral furnishings and a collection of modern artwork. See more of their work online at www.mendelsongroupinc.com. Photography by Eric Piasecki via Houzz.com. Tucked away in the Samuel & Sons studio, a unique Holiday Greeting came to life by way of countless hours spent planning, cutting and gluing. As you all know very well, even the tiniest details (especially in this case) can make all the difference. We called upon the creative talents of our Marketing Department who, using over a dozen different Samuel & Sons trims, created everything from roof shingles and tiny draperies to roman shades and pillows that can be seen through the windows. The entire home is covered in gimps, braids, borders, tufts and one of our personal favorite moments, the icicles created from our Swarovski Crystal Fringe and Pisani Hand Blown Glass Fringe. Tell us, what’s your favorite detail?